The second practice session for the IZOD IndyCar Series offered some surprises and some similarities to the morning practice. Once again, Will Power was at the top of the time sheets, throwing down a blistering 1:02.3200 sec lap time! 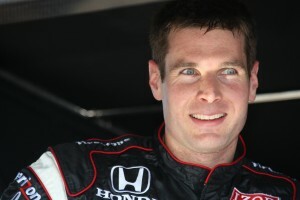 That’s close to the 1:02.1355 sec ICS record time he set in 2008 in his first IndyCar race in 2008. To put it more into perspective, the closest person to Power was Scott Dixon and he was seven tenths off of Will’s pace with a best lap of 1:03.0298 sec. While Power’s teammates did well in this morning’s session, they did not fare so well this afternoon. Ryan and Helio dropped to 5th and 8th. Hideki Mutoh who had been in the top five this morning dropped back to twelfth quickest this afternoon. Graham Rahal, however, improved his pace and was inside the top ten in ninth and only 0.23 sec away from sixth. Graham’s stated goal for tomorrow’s qualifications was to make the Firestone Fast Six. He’s not too far away! It could be a great weekend for the Sarah Fisher Racing crew if Graham continues to improve his pace. The surprise driver in the top ten this session was Takuma Sato, although some may not see it as too much of a surprise I suppose. Sato apparently figured out Turn 1 and put down some much faster times this afternoon than he did this morning, placing him as sixth quickest. The top five is really no surprise. Will Power, Scott Dixon, Justin Wilson, Tony Kanaan, and Ryan Hunter-Reay. Some may be surprised to see a Dreyer & Reinbold machine in the top five, but keep in mind that it’s Justin Wilson driving. He performed extremely well here last year in a Dale Coyne car, and won for Dale Coyne at Watkins Glen. Mike Conway struggled, but with Wilson as his teammate, don’t get used to seeing him at the back. DRR won’t be bringing up the rear this year as they have in seasons past. The third and final practice session begins tomorrow morning 0955 EDT, and qualifying begins at 1320 EDT. You can watch both live via IndyCar.com Race Control.